Very handy. Thank you, Mr. SG. Other than that, my questions seemed mostly met with a puzzled, vacant, vaguely cranky, straining-to-be-polite-to-the-customer-because-I'm-basically-a-nice-guy look, as in, "Lady, why are you making this harder than it has to be?" Or perhaps it was, "Lady, why don't you ask your husband?" Or, to be fair, maybe it was merely, "Lady, I haven't had my coffee yet." For example, when I asked about using a drip edge, he responded, "Well, I guess you could use one. Most people just slap the sheet metal on there and let it overhang. The overhang is all you need to keep the rain off." Well, that may or may not be true, but I didn't want a huge overhang because I just don't like that look. I didn't want to get into a discussion about the aesthetics of "long, unwieldy, trashy, half-hearted overhangs that look like an afterthought versus short, neat, tidy, trim overhangs that look like you care about good things in the world like, for example, beauty" with him, so I let it pass...and loaded the drip edge on the cart anyway. Mr. SGuy didn't go so far as to shrug openly when I did so, but I could see that he was apathetic about my choice. And he did answer other questions, such as whether I needed supports under the sheet metal ("Not really. Most people just screw the sheets to the studs and skip the supports underneath. "), and which ridge cap to use. By the time I had checked out, I was feeling vaguely nervous about both the project and about my own general can-do-ness; nevertheless, I loaded the material onto my trusty trailer and headed home. I need not have worried. Easy. As. Pie. I then measured the ridge cap to length and cut it. Because the ridge cap has "wrinkles" into which you slip the corrugated sheets, I wanted enough overhang to match the two components, and so when I cut it, I allowed for a one inch overhang on either side. Later, I would make a tiny snip in the center and fold the excess down and cover it and the sheets with a wider drip edge (strictly for looks). As you can see in the photo, the wrinkles in the cap (I'm sure they have a name, but I like "wrinkles"), are actually a few inches down the roof from the ridge itself, which means that the edges of the sheets are not the same length as the length of the roof. So in order to measure the sheets to length, I placed the ridge cap on the ground, slipped one of the sheets into the wrinkles as far as it would go, then measured how long it needed to be, allowing for a 1/2 inch overhang. I then cut all the sheets to length. See my earlier post here. Then I cut some scrap wood and screwed this into the rafters on the underside of the roof. You see, Mr. Sleepy Guy had given me an idea when he said that most people just screw the sheet metal into the studs. By putting the scrap boards approximately where I wanted to place the lag screws, I could just measure down from the ridge (15") and up from the bottom (11") and screw them in along that line without worrying about where the "studs" (in this case, the rafters) were. I believe there is a construction name for boards that exist for the sole purpose of nailing or screwing things in them, but for the life of me, I can't remember it...This is called "strapping." Anyway, once all the sheets were cut, I tacked the ridge cap to the roof and slipped the first sheet up under the corresponding wrinkles, and tacked that (see the second photo, above). Since I was doing all this by myself, I held each sheet in place with clamps at the bottom to position them while I attached the lag screws. 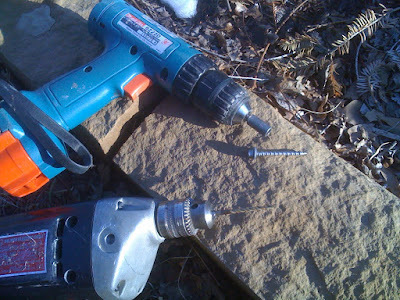 To screw them in, I first used an electric drill (more power than a portable drill) to make a hole (shown with the bit in the first photo), and then followed that with a portable drill with the bolt bit and lag screws. I also used a rubber hammer to apply some "carpenterial persuasion" to the wrinkles to make them adhere more neatly to the corrugated metal below. The ridge cap is made from heavy gauge aluminum, and so this is very easy to do. The only other counsel I would offer about roofing is to make sure that any edges that have to overlap (as in drip edges, or shingles, or whatever) are "shingled" so that water runs down off one onto the other below it. In other words, the lower piece of roofing material is always underneath the higher piece. Good job, it looks great. I'm impressed with how easy you make it look (I'll bet it's not that easy for some of us). I've seen that look before when I've gone to the hardware store looking for thing to use in non-traditional ways, that bemused & slightly appalled look. 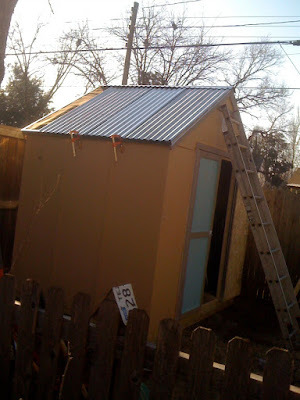 Susan, We (and I use that pronoun very loosely) did more or less the same thing with our garden shed, but using board-and-batten style galvanized roofing. Our main impetus was to thwart the raccoons who were using our cedar-shingled shed as their local latrine. Removing the shingles was an adventure in toxic wastes -- and again I'd apply that loose "we." So far, the raccoons are only slightly redirected. But at least we now have a surface that effectively "wipes clean with a damp sponge." And the shed is certainly waterproof! P.S. To be fair, my use of the word "we" contains no actual "me." I also love your winter arbor picture....very beautiful! 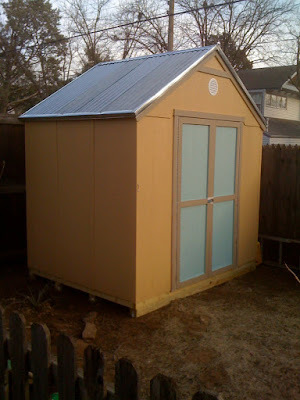 Great how-to post, Susan, and your shed and roof look great. Congrats! Very cool! I'm so impressed. As for Home Depot, I do try to go to other hardware stores. I've found the staff incompetent, and they've lied to me. "Do you have the ." "Yes, of course." So I drive 8 miles, and they don't have it. Could have ordered it online. Well, at least you got lucky and they guys spoke English. Your tools are impressive. I do believe I just might have to buy myself a few special tools as I have some remodeling work ahead of me. My husband is totally competent in that department but hates (HATES) doing any remodeling unless it happens to be on his motorcycle or plane. TM--I usually go to HD because they are just down the street. They have limitations, but for simple things, they usually do OK.
Lindy--Tools are a girl's best friend. You. Are. So. Cool. I'm going to use "carpenterial persuasion" on everyone, all the time! Hand me my ball peen! If the ridge cap is Aluminum, it will hasten rust in the steel roof: dis-similar metals. A dab of caulk on top of each roof corrugation should "glue" it on well enough while providing a dielectric break. it looks like you attached a drip edge at the bottom of the roof line, on top of the metal panels. Wouldn't this cause water to run under the drip edge, rather than over it? Yes it would, but that edge is merely decorative. There is another drip edge under the metal sheets. Wow, it is an amazing blog. I love it. 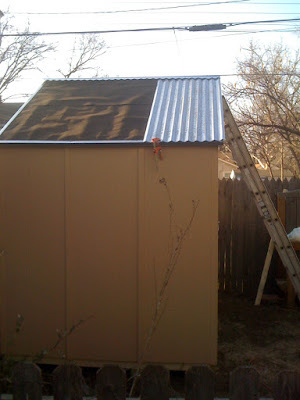 Thanks for providing such a helpful post for attaching corrugated sheet metal to a shed roof. Curious how you cut the sheet metal.